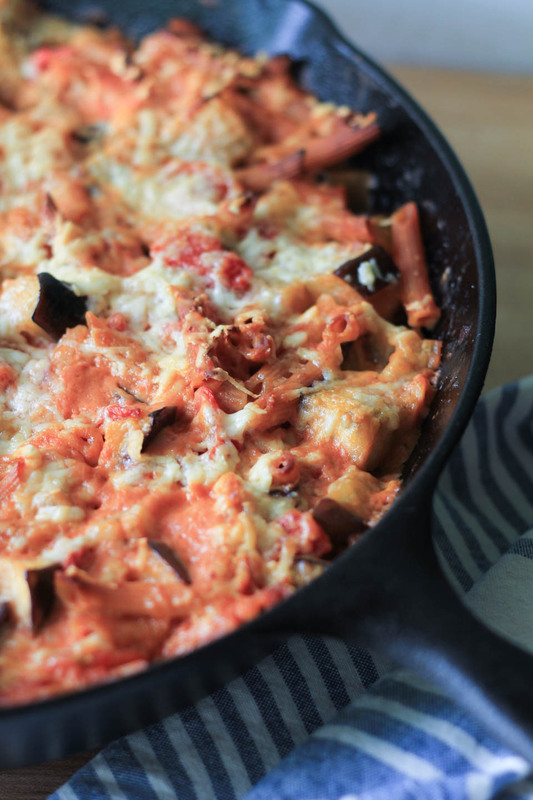 This Lentil Pasta Bake with Eggplant Tomato and Goat Cheese Is a big bowl of comforting pasta with tons of flavorful vegetables and cheesy goodness! Some days are meant for pasta, am I right?!! 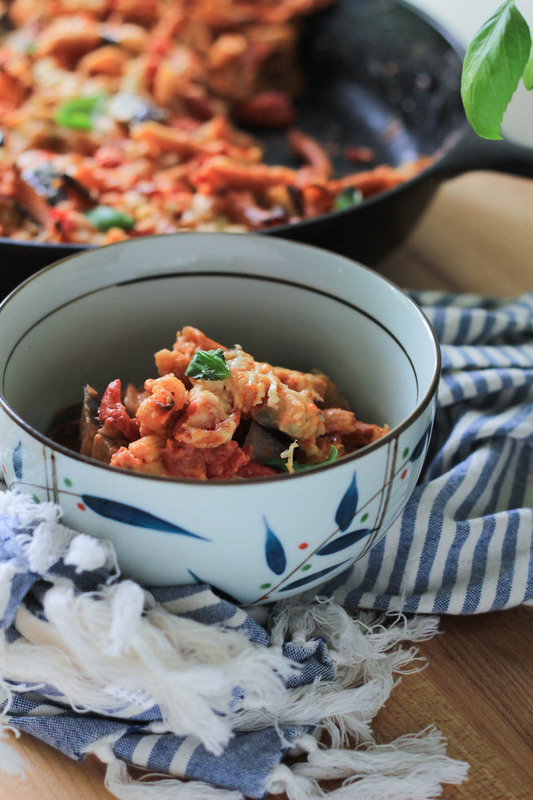 A big comforting bowl of food dotted with creamy cheese, sweet tomatoes, and nutritious vegetables. This week is perfect for this new recipe. I know, we all talk about the weather. Every single one of us does it, I think it’s because it’s a part of our daily lives. The weather changes what we eat, what we do, where we go, so it makes sense that we all talk about the weather. And around here, typical Pacific Northwest weather for Spring, it was seventy degrees and sunny, now it’s fifty-five and raining. This weekend it will be eighty degrees and sunny, time for hiking! So this dish comes at a perfect time for my mental comfort needs. It’s cold and rainy, the clouds are in full effect, the wind is blowing, and that makes me want a big bowl of warm, garlicky, comfort food. Uh yes, there is tons of garlic in this recipe and that is all you will smell when you’re making, it permeates the house in the most delightful way. Garlic with a touch of tomato, maybe that will be my new scent. I either smell like a baker or a chef, there is not a whole of in between for this lady. It’s all food here, all of the time! Brian secretly loves it, when I made the Lemon Pound Cake earlier this week I smelled like baked goods and butter, both excellent things. Today it will be garlic through and through. optional side salad for serving: 6 cups arugula tossed with with 3 tablespoons olive oil, 1 tablespoon balsamic vinegar, pinch salt. Place oven rack in center of oven and preheat to 400 degrees. Sprinkle eggplant with salt and let it drain in a colander for 15 minutes. Use this time to get the rest of the ingredients ready. After 15 minutes, rinse well and pat dry. Place olive oil in a large 12 inch oven safe skillet* (I used cast iron) over medium low heat, once oil is shimmering, add garlic, cook for 30 seconds until fragrant. 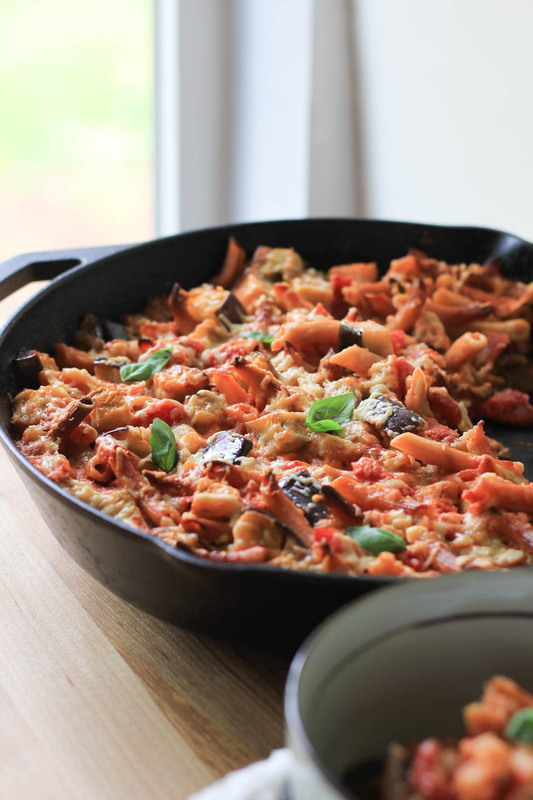 Add tomatoes, water, goat cheese, pasta, and eggplant, stir to combine. Turn off heat. Sprinkle top with grated Parmigiano Reggiano. Place in oven and bake for 25 minutes covered with foil. Remove foil and cook for 5 more minutes to brown to cheesy top. Remove from oven and serve immediately sprinkles with fresh basil. Store leftovers in an airtight container for up to 3 days. Note * If you do not have an oven safe pan, cook the garlic in olive oil, then add that and the rest of the ingredients to an oven safe baking dish and bake. Optional: Serve with a pile of arugula salad for more vegetables. This looks amazing! A big bowl of warm comfort! It’s freezing here so this would be perfect for dinner tonight! Oh yes! Thank you :). I’ve never tried lentil pasta but I’m intrigued. It is so good and filling. I use it all of the time now. I love this! I recently tried one of their pastas that they were sampling at Whole Foods and was blown away! So so good. Some days are definitely meant for pasta!! And I’m seeing that day in my close future because this looks wonderful! So full of flavour! Every day was meant for pasta haha! I can’t wait to make this! Ok, I totally agree :)!!! Every day should involve pasta! I am going to look for this Lentil Pasta. It looks great! Isn’t it weird how affected by weather our diets are? The second it becomes cold and rainy I crave comfort food. Not that I want cold or rain but I’d definitely make the most of the next day like that with this delicious dish!